A carriage garage door adds instant charm and character to any home. However, traditional carriage style doors are typically heavy, expensive, and a bit cumbersome. Fortunately, you can get beautiful roll-up carriage style garage doors in Porter Ranch CA that will work with your existing garage door opener simply by calling Carroll Garage Doors. If you want something really unique, we can help you order a custom door with the perfect design elements for your needs. Check out our online design center for a taste of the possibilities. A new garage door is an important investment in the curb appeal and value of your home. Don’t trust this investment to an amateur! If you want to get the most out of your carriage garage doors in Porter Ranch CA, they need to be installed properly and professionally. With Carroll Garage Doors on the job, you can rest assured you are getting quality installation to prepare you for years of trouble-free operation. We are happy to offer warranty coverage on our installations, as well as free 4-sided weatherstripping. Need Service for Carriage Garage Doors in Porter Ranch CA? Already have carriage garage doors in Porter Ranch CA? We can provide maintenance and repairs for both swing-open and roll-up carriage garage doors, as well as for the garage door openers that operate them. Whether your garage door is totally inoperable or just a little noisy, you can call us for help and reap the benefits of our 19 years of experience in garage door repair. Whatever your needs, you can trust Carroll Garage Doors to take excellent care of you. 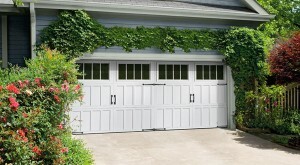 Call now for any kind of help with carriage garage doors in Porter Ranch CA.